»The Captivating Town Of Munsiyari That Will Intrigue Any Explorer! The Captivating Town Of Munsiyari That Will Intrigue Any Explorer! Munsiyari, a quaint town in the Pithoragarh district of Uttarakhand, is an intoxicating hamlet, gifted with natural beauty in abundance. It is surrounded with captivating snow-capped mountains, that is famous for many trekking trails. Munsiyari plays as a gateway to the Johar region, and is perched at an altitude of 2,298 m and settled on the banks of River Gori Ganga. The name Munsiyari literally translates to "Place with Snow", because the town is filled with glaciers and snowy peaks of mountains - a favoured destination specially amongst mountaineers. It is fondly known as "Little Kashmir", due to the snowfall on its mountains. The town is fringed with dense forests that is home to many alpine wildlife such as whistling thrust, hawk cuckoo, mountain bear and musk deer. The main inhabitants are the Shauka tribe people who worship Goddess Nanda Devi. East Munsiyari is now mostly deserted because the locals had to migrate after their trade with Tibet was stopped completely. The untouched beauty of Munsiyari is therefore nature in its purest form. Munsiyari is a magnificent place that can be visited at any time of the year. However, during the summer months, a clear view of the lush greenery that surrounds sky-high mountain peaks is visible, and this time is perfect for trekking. The ideal time to visit Munsiyari for those who love snowfall is during the winter season, when one can even go for skiing! By Air: Pantnagar Airport is the closest air-base to Munsiyari, located at a distance of 313 km. But since mostly the flights here are domestic, Indira Gandhi International Airport of Delhi, located at a distance of 560 km, is the closest commercial airport that is connected to all the major cities like Mumbai, Kolkata, etc. By Rail: Located at an equal distance of about 220 km from Munsiyari are the railway stations in Kathgodam and Tanakpur. Regular trains come from places like Ranikhet, Lucknow, and different regions of Uttarakhand. By Road: Private and government buses are available from neighbouring towns like Tanakpur, Almora, Champawat, etc. Taxis are also available from major places in and around of Uttarakhand to Munsiyari. Here are the places to visit and things to do in and around Munsiyari. The Panchachuli peak is a group of 5 peaks of the snow-clad Himalayan mountains settled on the east of Kumaon region. With peaks ranging from the height of 6,312 m to 6,904 m, the Panchachuli peak is a popular trekking destination. A legend behind the origin of the name is that the Pandavas from the Hindu epic Ramayana, were believed to have had their final meal here before finally going to heaven. "Panchachuli" literally translates to "five cooking hearths". 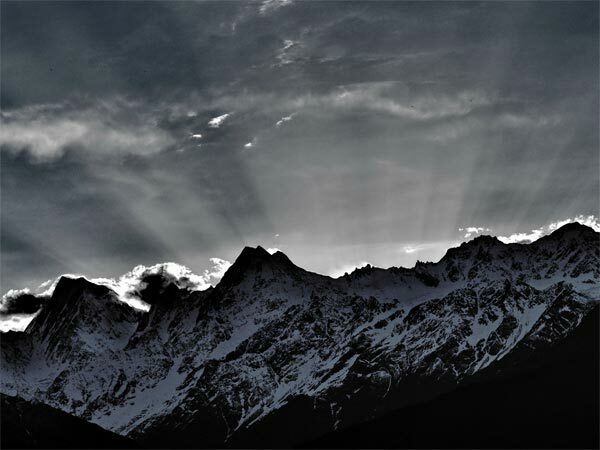 The Panchachuli peaks is an evident part of Munsiyari that gives the town a majestic look. It overlooks the town and the sight of sunrise or sunset from here is simply breathtaking. Perched at an altitude of 11,500 m, Khaliya Top or Khaliya Peak is an awe-inspiring spot of meadow, that gives a magnificent view of the snow-capped mountain peaks surrounding the Kumaon region. The Khaliya Peak is also a favoured trekking spot, especially for beginners who wish to explore more of the Himalayas. The trail of the trek is filled with the scent of beautiful alpine trees such as spruce, pine, old oak and cypress trees. It is a relatively easy trek of about 10 km from the base. Nestled amidst the thickets of Himalayan forests, Birthi Falls is a mesmerising and secluded waterfall located near Munsiyari. It is a popular picnic spot amongst tourists. A small trek through the beautiful forest will reach you to Birthi Waterfalls. It falls from a height of 2,200 m.
The water trickles through the rocky mountain terrain, and is usually brimming with water during monsoon. So if you're around Munsiyari during monsoon, make sure to visit this spot. Madkot is a famous spot for hot water natural springs, located about 5km from Munsiyari. The natural spring is believed to have healing properties for skin rashes, burns or body aches. A taxi can be taken from Munsiyari to this quiet, isolated village that usually has a pleasant weather throughout the year. Apart from these peaks and waterfalls, Munsiyari is home to beautiful glaciers that you might've never witnessed before. Namik Glacier trekking is a popular trail of trek that is located 40 km from Munsiyari.